There was pandemonium in Awka-Etiti area of Anambra state after a businessman simply identified as Ebuka, was humiliated and disgraced after being accused of killing a 9-year old boy. According to reports, the boy was said to have stolen biscuits from the accused shop in the company of his younger brother. This story is still sketch but according to a report by Eyewitness.ng, trouble began when his skin and that of his brother began to rot. The parents made some attempts to inquire the root of the problem and it was gathered that accused was alleged to have a hand in it. According to reports, the dealer who dedicated his shop to some deities in Ukpor in Anambra State was demanding for the sum of N15m. N475,000 was paid (according to an eyewitness) and all attempts to save the life of the lad proved abortive as he gave up before the parents, Ebuka and the deity within the week. 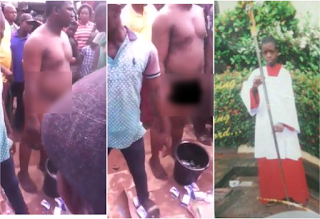 1 Response to "Anambra businessman disgraced publicly, stripped naked for allegedly killing 10-yr-old boy"